An investment in yourself is a guaranteed return every time. Whatever you choose to do, it will produce a tangible result every time that will make you a better person. Investing in yourself will help you gain knowledge. You will build confidence as you have success with new things. It will teach you lessons you could never have learned otherwise. It also has the chance to produce financial returns far better than you could produce in the stock market (at least in the short term). 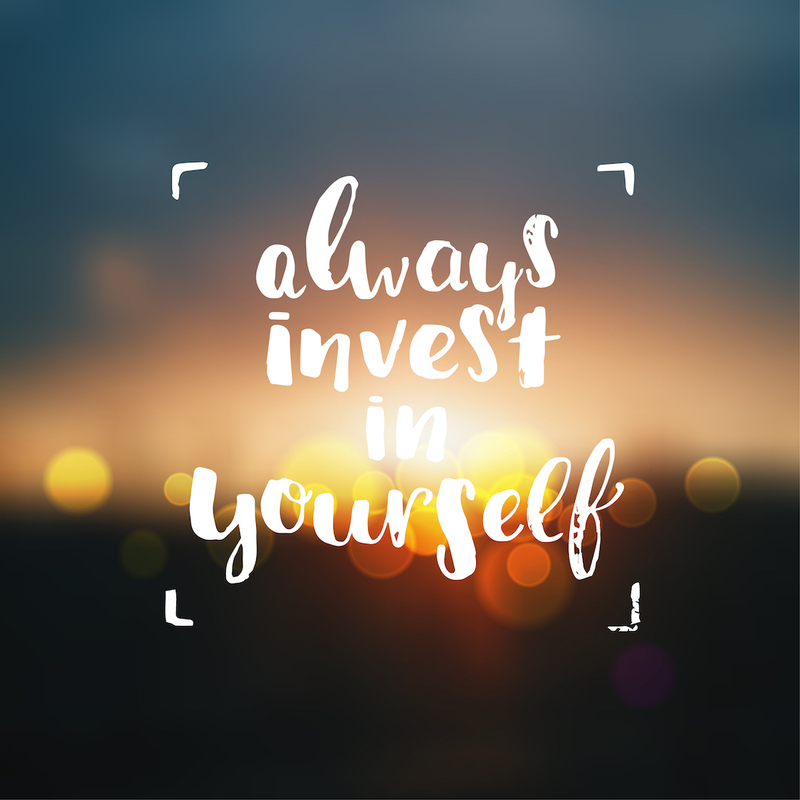 Investing in yourself is the best investment as it relates to the advancement of your career. Your career is the biggest wealth generating mechanism you will ever have. Because it is so, it’s worth spending money in this area to enhance your career opportunities. This isn’t just theory. Here’s an example from our life of how this worked. Several years ago my wife decided she wanted to switch careers from high school math teacher to CPA. That’s a pretty big leap, one that was incredibly scary to pursue. We knew it would take considerable money and time for her to return to grad school. However, there was no way she could pursue this position without these sacrifices. So we decided to invest in tuition payments for her classes. At the time, we weren’t sure if it would be worth it. But now, looking back at it, I can say it absolutely was. Her salary now as a CPA is significantly higher. Additionally, the prospects for career advancement going forward are limitless, bound only by her personal desire for what she wants to become. But just think about the math if you need some more encouragement. If you can double your salary from $30,000 to $60,000 per year, that’s a difference of $600,000 over 20 years assuming no raises whatsoever. But also consider that that amount becomes even more significant when we consider how your excess earnings could be invested in the stock market generating the 8-10% returns I mentioned above. 1. Read great books. Research shows us that the average millionaire reads one book a month. That’s certainly doable and relatively inexpensive. 2. Listen to podcasts. Find a podcast that works for you and listen to them in the car, when you prepare dinner, as you get ready in the morning or right before bed. 3. Eat healthier and exercise. You won’t have the energy and stamina to tackle challenges if junk is going into your body and your muscles are lying dormant. 4. Join a club, social organization or other like-minded community. This action is all about helping connect with others. Opportunities often come not by what you know but by whom you know. 5. Attend conferences in your field. These are generally cheaper than a full-blown education and can provide the necessary training you need. Plus, it’s another great place for making connections. 6. Enhance your spiritual side. In addition to the physical body, the soul needs to be strengthened so it can endure difficult times ahead. So meditate, read the Bible, go to your local church and or simply be open in sharing with others what is on your heart. 7. Find accountability partners, a mentor or life coach. These people are designed to keep you focused and on track. Furthermore and more importantly, they can often provide that little push we are unable to give ourselves. 8. Replace some bad habits with new ones. We all have junk in the closet that needs to go. Identify yours and then build some good habits to rid yourself of the bad. 9. Practice gratitude. We are so blessed already. Dwell routinely on and be thankful for what you do have, not on what you don’t. 10. Learn the basics of a new language. In our ever-diversifying society, employers need people with language skills. This could be something that stands out on your resume and separates you from job applicants. 11. Take a personality test. You may not know in which direction to proceed until you know more about yourself. Something like the DISC profile may be just what you need. 12. Get organized, set schedules and learn to develop goals. You can’t move forward unless you are on top of your daily routine and have some targets to hit. He who aims at nothing will hit it every time. 13. Participate in activities that promote peace and relaxation. Listen to music, go for walks or get a massage. Write. Cook. Paint. Go to a museum, do yoga or lay out at the beach. Whatever works for you…just learn to relax and recharge. 14. Play. Life’s going to get dull real fast if you don’t let your hair down every once in awhile. So enjoy some moments of frivolity simply for the fun of it. There are times when focusing on yourself is the best investment you could make. It’s OK to be a little selfish in this regard. Be brave and figure out what you need to move forward and do it. Some great returns are waiting. Questions: Have you ever considered investing in yourself as the best investment you could make? What could you do now to improve your circumstances and financial picture? Yes, yes and yes. So many people are afraid to make changes like your wife, even when the returns are HUGE. Plus, there are so many ways, like you listed that can increase your earning potential. Great list, Brian! While I don’t think that it’s always justified in every situation, in general getting a college degree has a great ROI. It’s unfortunate people take such a negative view of student loan debt because some of it is reasonable and ultimately will pay off in dividends. Same for many advanced degrees. The negativity surrounding student loan debt I think comes from those who use it without understanding it and rack up enormous debt levels for degrees that have little hope of paying that debt off quickly. You shouldn’t be going 100k+ in debt to get a degree as an elementary teacher for example. You’ll be paying off that debt for decades. Fact these 14 ways of investment is very important for that wish to grow personally and professionally and many of these tips are inexpensive, so I guess that depends on each person to succeed, and not get colcoando the blame on others after a while .. I would like to throw this out there and say that investing in my dog might be the best investment I’ve ever made. For the number of hours of entertainment that I receive versus the costs of ownership it’s basically pennies per hour. I don’t know that many activities that cost less than a dollar per hour and make me feel as happy as she does. Perhaps you could say this is investing in my health because my quality of life has gone up because of her. I can see that. We certainly enjoy our dog and the cost of ownership is small, unless there are big medical issues that come. A lot of those 14 things you’ve listed are free but definitely go a long way to making yourself a more well rounded person. Actually I think only the one about attending conferences would probably cost money, but then again there are ways that the expenses can be lessened too! I’ll be trying to do that so I can attend FinCon next year. “…free…” Yes…working on yourself doesn’t necessarily have to cost money. While in theory I’d like to agree with you, I think student loan debt and subsequent low paying careers for many college grads makes a pretty compelling argument for an investment in yourself not always being worthwhile. “…student loan debt and subsequent low paying careers…” Those are very good points Stefanie. People can’t blindly invest in themselves assuming everything “will just workout.” It takes wisdom to know what and when to do something. I know it isn’t the point of the post, but it is sad to me that teachers make so little that you have to go back to school to make more money. Jim has doubled his salary over the past couple of years by earning another degree. He is still in education but out of the classroom. In our situation, the money spend has already been paid back two fold, so I think that’s a great investment. And the last thing a teacher really wants to do after teaching school is to go back to school themselves. With their schedule it’s really hard to find time to make that happen. Best time is during the summers of course but if you limit it to that time frame you are really dragging out your degree program. I won’t lie to you…it was a scary proposition changing careers at this stage of life. Took us some time thinking and praying about it just to pull the trigger to start. Ha, as a CPA I’ve often wished I was a high school math teacher. To keep my license in the state I live in, I’m required to take 40 hours of continuing education a year. I’ve been guilty of filling those hours based on what fits best in my schedule regardless of the topic, but now I try to find topics that will actually help me grow or teach me something. It’s much more enjoyable in the short-term and far more valuable in the long-term this way. Outside of this required learning, I try to read a book a week and I listen to podcasts daily. I never want to stop learning. “…I try to find topics that will actually help me grow…” That’s much more enjoyable when you know the topics being learned will add value to your life. Nobody likes taking classes just for the sake of doing so. How boring. Love this, Brian! I agree the best investment you can make is in yourself. To believe in yourself and to know that you are worth it! One thing I see too often is people who don’t think they worthy of happiness and it breaks my heart. I’m doing every you listed and it does make a huge difference. I feel more balanced and well-rounded. Well, in fairness #10 isn’t happening right now, but it’s certainly something I would like to do! “…to know that you are…worthy of happiness…” We are and so many don’t see it. Past hurts and negative feelings towards oneself can be very difficult to overcome. Right now I am working on investing in myself through eating healthier, getting exercise, and learning and developing new skills. I also am trying to focus more on studying the bible and growing deeper in my faith. ”…getting a college degree has a great ROI.” Agreed…As long as we aren’t going 100k in debt for a basket weaving major. 🙂 Be smart people…choose your majors wisely, investigate the future earnings potential and limit your school loan debt. I could not agree with this more, Brian! An investment in yourself is the return that gives perpetually. I was a mess a few years back and realized it was because I did not work on myself enough and when we don’t work on ourselves, we can’t be good to other people. For me, I make sure I make time to work on my physical health as well as my mental health. I work out at least four times a week and read as much as possible. Reading is such a big deal. We have to keep growing personally and professionally if we are going to succeed and reading can be a big part of that. Sitting on the couch all day watching TV or perpetually scanning Facebook sure won’t. We can’t grow if we don’t go and do for ourselves. Great instruction Brian, I wanted to add that I enjoy journaling when I can. Getting my thoughts down on paper (in an organized way) helps me to filter through them and reach concrete conclusions. It’s incredibly stress-relieving too! I think that’s a great way to relax. And probably vent off some frustrations as well.